We asked attendees of the Global Investing Made Simple seminar to give us their feedback, and Ramsha Zia wrote us a nice passage to describe her experience and we thought we should share it with you. Sometimes we find ourselves in situations that can change our lives. 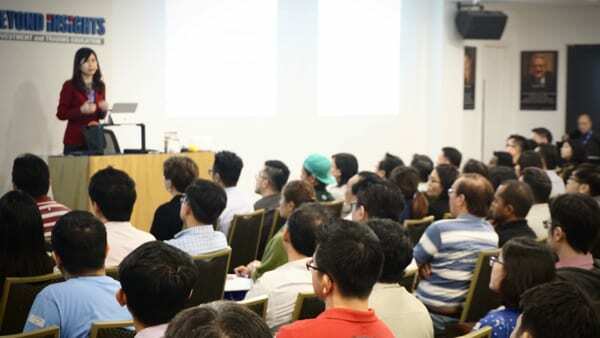 I found myself in a middle row at a Beyond Insights introductory seminar last week, titled Global Investing Made Simple and I will end by saying that I came out inspired. But let me go back a little to the start and explain what this is about. A colleague suggested to me to attend this event; this was a result of a conversation we had about my desire to start saving or secure a secondary source of income. Something that could help me build wealth and gain freedom from “the grind”. The Grind is your normal 9-5 job. Most of us are employed in these, 5 days a week. This is where our professional careers start and eventually end when we retire. For me, I am a public relations consultant by day and a film maker by night…or in whatever free time I have! I enjoy both my chosen career paths and pursue them with genuine interest. So what’s the dream? I want to have a successful career as a public relations consultant on my own. Maybe start my own consultancy. At the same time I want to earn enough to be able to make the documentary films I want to make and take time off whenever I like. But I have practical concerns like bills and rent, living expenses and such. I want to travel and spend time with my family and loved ones. Now I am not rich nor is my family well off, so this “ideal dream” seems a little absurd and farfetched. But I was curious nonetheless. I wanted to know what I could do to get started on this path and create the life I want. One thing I have recently realized though, as I have done the related research, is that essentially you need money to make more money. Whether you decide to start a business to earn extra, or buy smart business clothes for a new corporate job. Life and success requires investment of effort and cash. What would help my wealth grow and make me wealthy like I want to be? The answer seemed to bein that email my friend sent me that morning. Investing and trading is something thousands of people are involved with and there is potential for serious wins. Except, I had no idea where to start. I didn’t even know what it meant exactly to “trade” or invest. It seemed daunting but my curiosity was piqued and I wanted to know more. So both my boyfriend and I signed up for the seminar. We walked in blind, no clue of what we were about to experience and learn. Beyond Insights is the brainchild of Malaysian investment guru and massive success story, Kathlyn Toh. She has had an illustrious and phenomenal career as an investor and trader. She has a track record for growth and success for many years now, and she shows proof of her successes at the event. The seminar was full of great information and made it easy for even someone like me to understand what was going on. And not just understand but also get interested and inspired to learn more and try my hand at trading myself. For the duration of the seminar I was hooked in and completely focused. Not once did I feel bored! What I liked particularly was that Kathlyn dispelled the myths about trading and investing. She made sure to point out that this is not a game and it is not gambling. Those who see it as such are the ones that suffer great losses. She pointed out that there is a smart and safe way of doing this and that is what they teach you at Beyond Insights. I learnt how to expand my wealth and worth in a safe way while finally getting some free time to pursue things other than your job! She spoke about how much her life has changed since she started out and what she has gained from being a trader. I was particularly in agreement with Kathlyn’s feelings about spending time with the family and how important it is. It touched me on a personal level as I am an only child and very close to my parents. I too would like to be near them more often and also have the financial strength to help them out if they need it as they get older. I want to treat them to holidays and basically make them happy. After all that they have invested in me, I would like to invest too and give back a little. I was so excited about the whole deal after the event that I actually kept on researching investments and trading even afterwards. I am convinced that this is what I want to do with my money and the path I will take eventually towards achieving my goals. I am well aware that I need to learn a lot more and that it isn’t easy. You don’t become a millionaire overnight and any scheme that claims to do that should be approached with caution! This is nothing like that. For me, it looked like a a proven and time-tested method. I sincerely hope that others will also be inspired to try out investing and trading to achieve their dreams. Thank you Kathlyn and Beyond Insights for inspiring me at this event! Ramsha Zia attended Global Investing Made Simple seminar on 8th February, 2017. She works in the area of public relations, photography and creative arts. This writing is published with her permission.